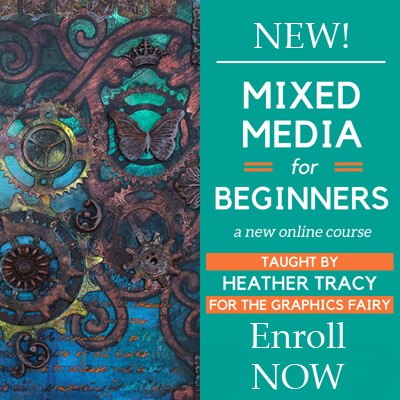 Hello, my dear Graphics Fairy Friends! Heather from Thicketworks here. 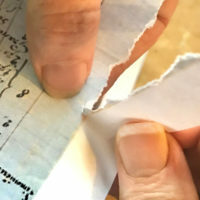 If you’d like to convert a cereal box into an Ancient Relic – join me as we delve into this fun process! I’ve been on a Rust Effects Paste kick lately, and am thrilled to share some of my latest experiments with you! If you’d care to play, grab a few tools and supplies and prepare to have a wonderful time! 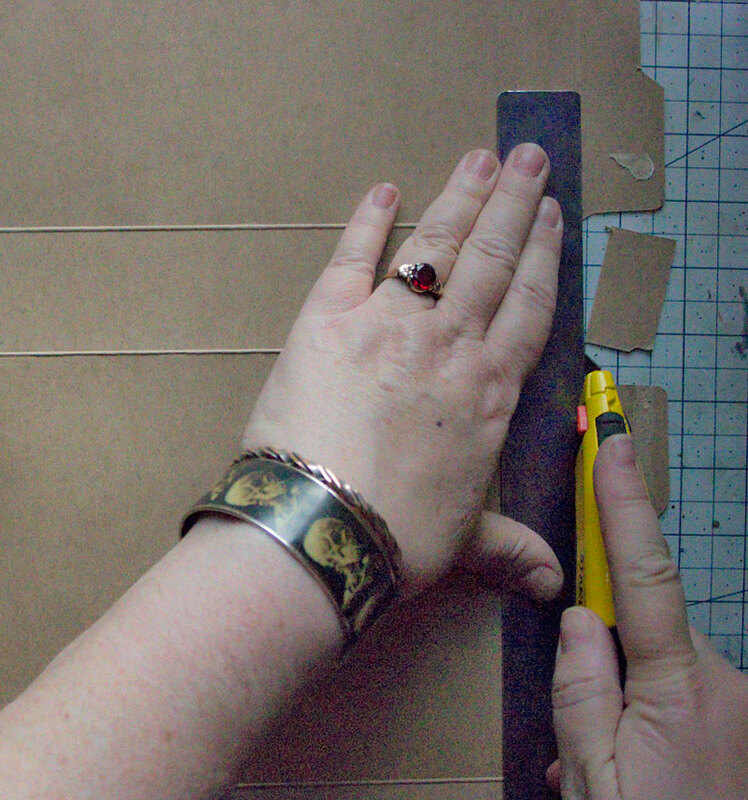 A piece of cardboard as a work surface will help to save your table top! 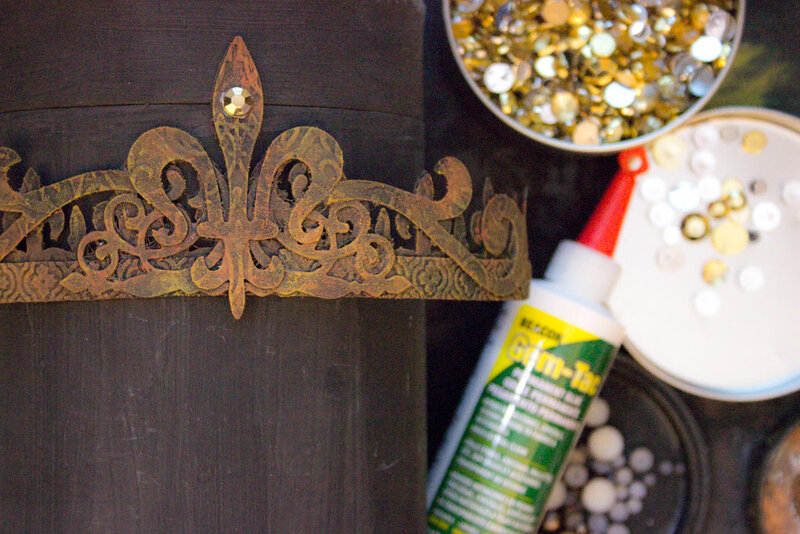 A cylindrical form (think old Quaker Oats box or similar) to support the Crown while applying Bling! Can it be transformed into something Magical? Begin by salvaging chipboard from the Recycle Bin! 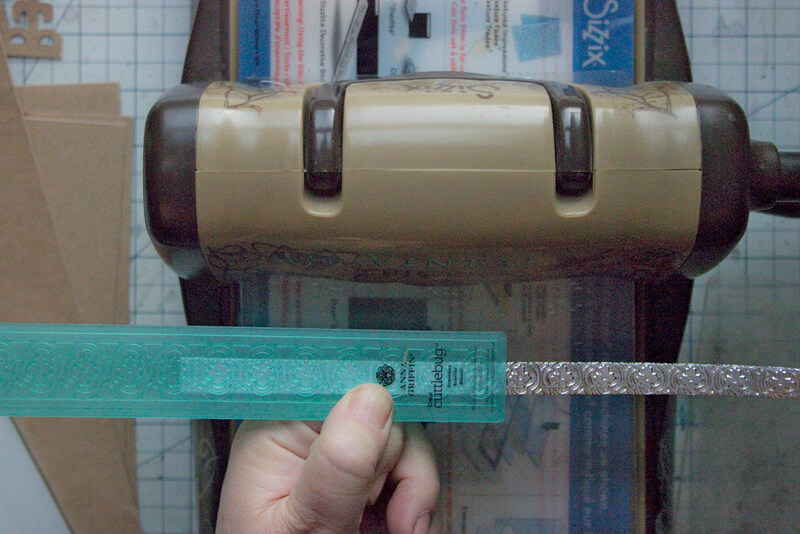 Trim the pieces to a size that will easily fit the Dies that you will be working with. 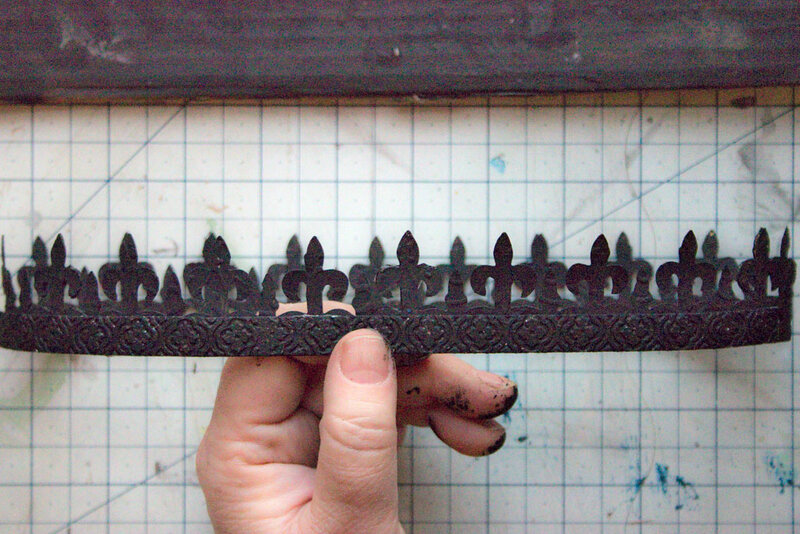 Use the Tim Holtz ‘Iron Gate’ Steel Rule Die to cut multiples of this lovely Fleur de Lis border. For an Adult Sized Crown, 5 repeats (more or less – measure your head) will do the trick. 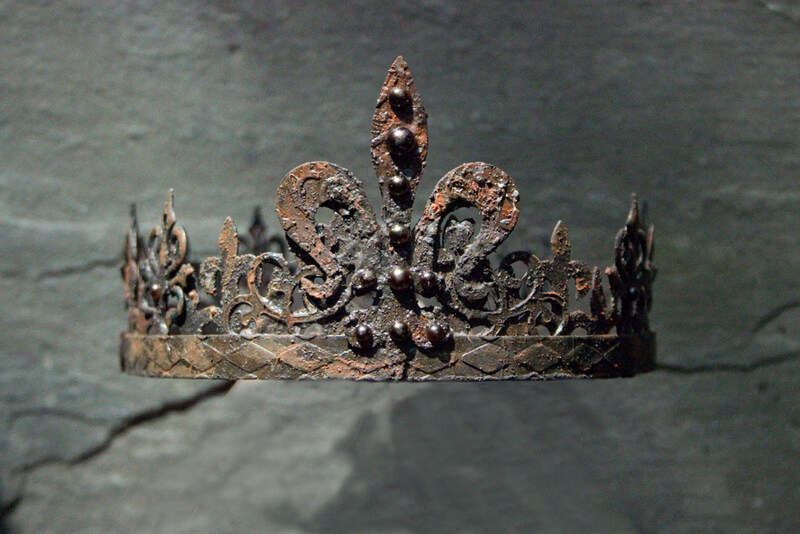 For the Smaller Sized Crown, 3 repeats were used. 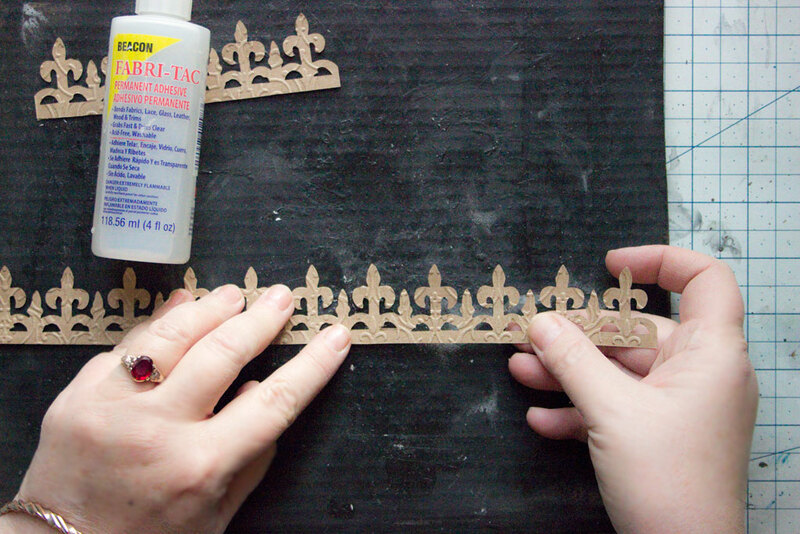 Attach the Die-Cuts end to end using a strong adhesive like Fabri-Tac Adhesive. 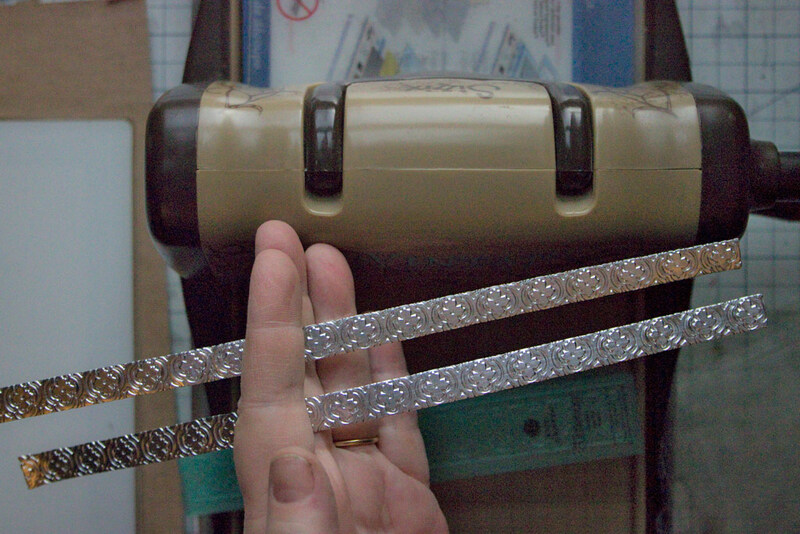 Fold matching lengths of Metal Tape into sturdy bands. The resulting bands will be flexible and strong! 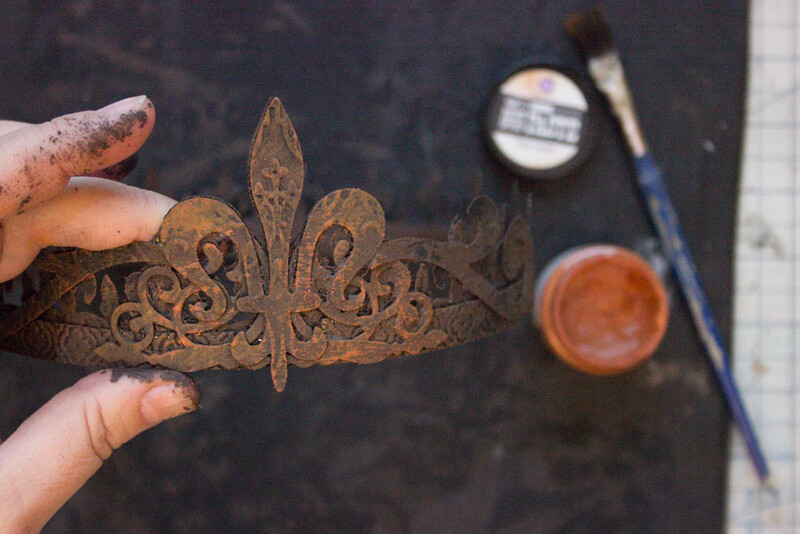 This will make your DIY Faux Metal Crowns robust and ‘moldable’, for a perfect fit! 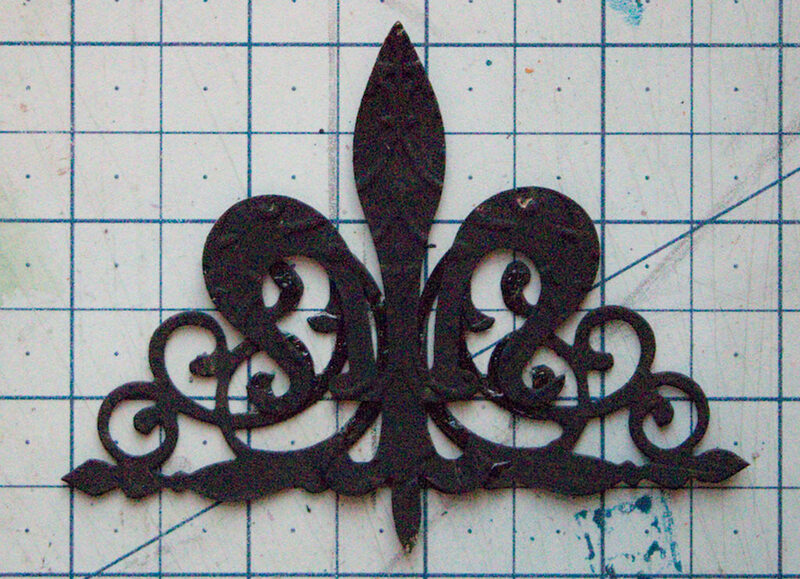 Sizzix “Classic Icons” Steel Rule Die : for the Fleur de Lis – cut 2 for each DIY Faux Metal Crown. 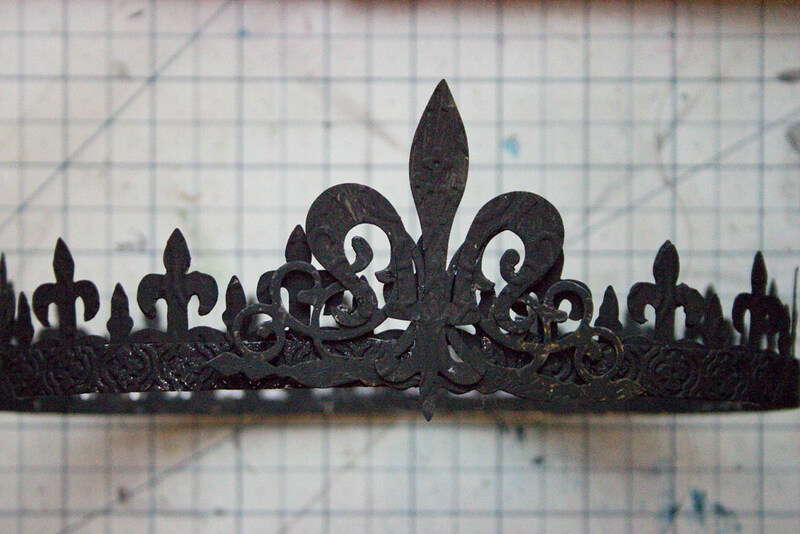 Sizzix “Classic Icons” Steel Rule Die : for the Flourish – cut 2 for each DIY Faux Metal Crown. 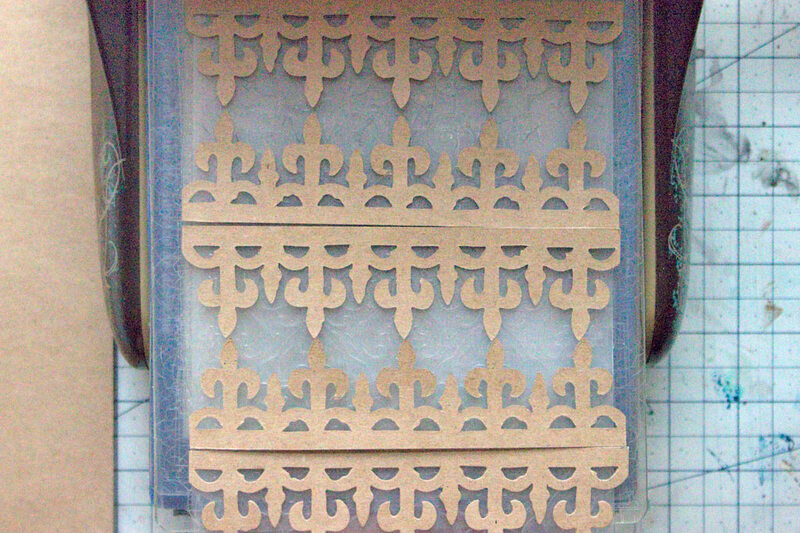 Sizzix “Curly Gate” Steel Rule Die : cut 2 for each Crown. 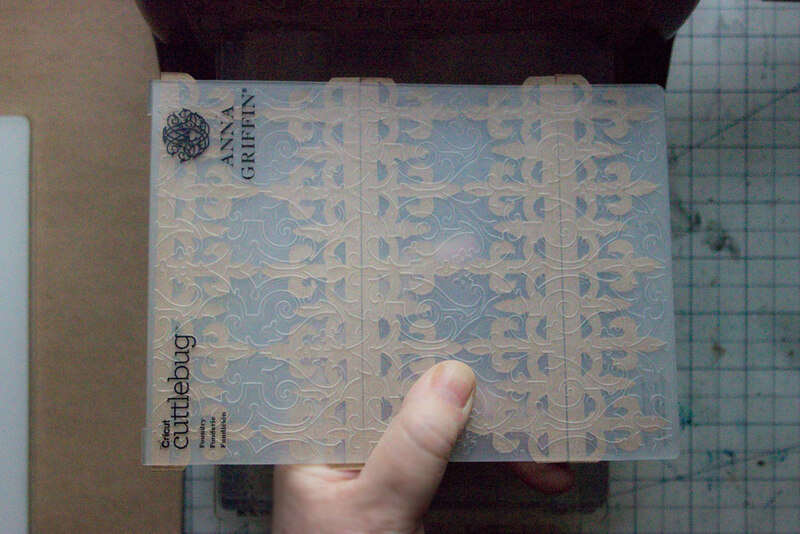 Create a circle by adhering the ends of the Iron Gate Die Cuts together with Strong Adhesive. Apply the bands of Embossed Metal Tape over the exterior of the circlet. 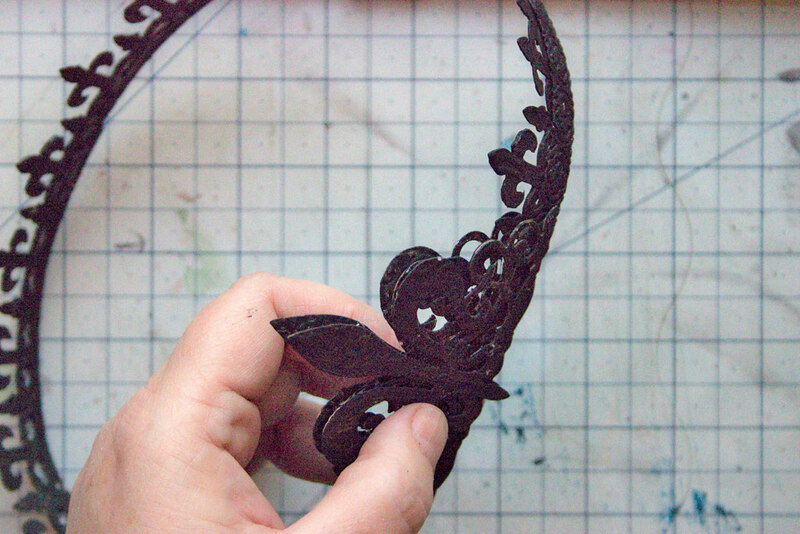 Layer the Large Fleur de Lis over the Curly Gate Die-Cut. Adhere. 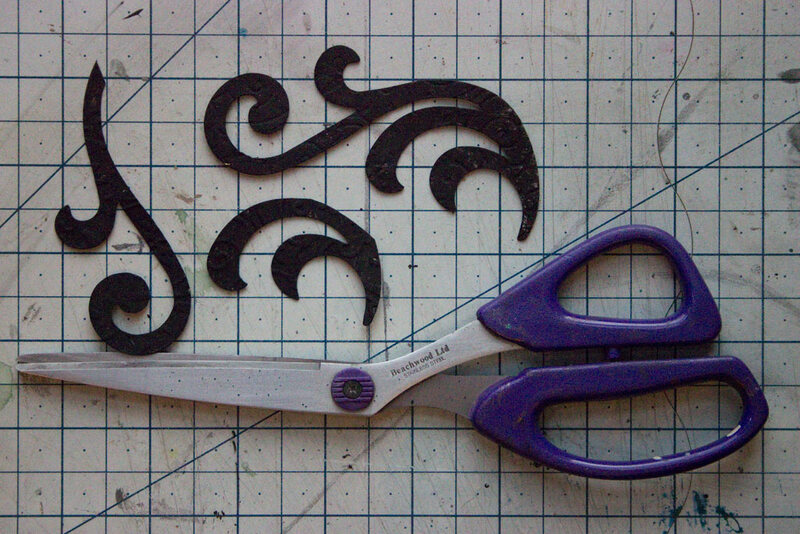 Snip the two Flourish Die-Cuts to isolate the longest curlycue. 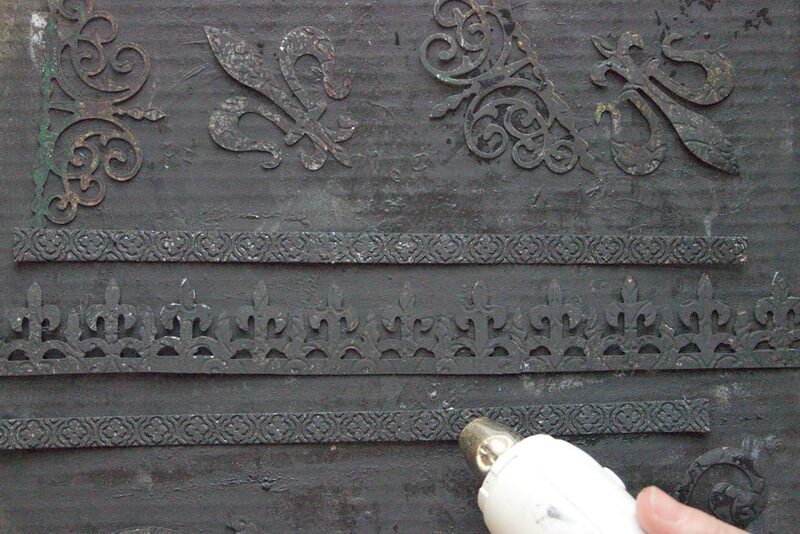 Adhere the Flourish to either side of the Fleur de Lis. You can incorporate the smaller pieces if you wish. Just make an Executive Designer Decision, and glue them in place! 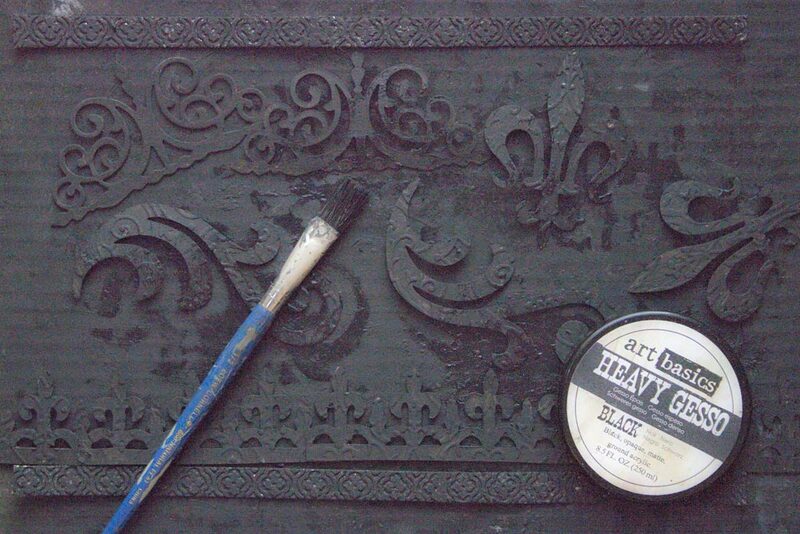 Follow with touches of Rust Effect Paste: Red, concentrating on the areas you wish to appear Deeply Rusty! 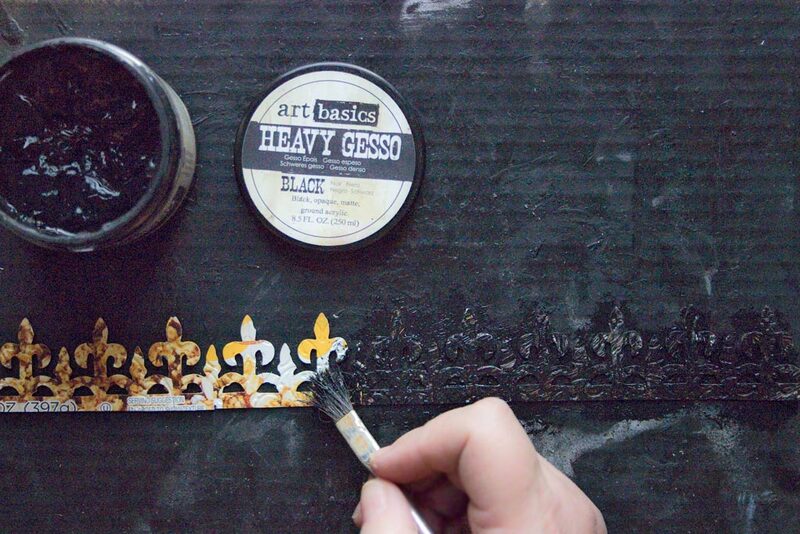 Highlight small areas with Rust Effect Paste: Gold applied in a ‘dry brushing’ technique. Dry thoroughly with a Heat Tool. 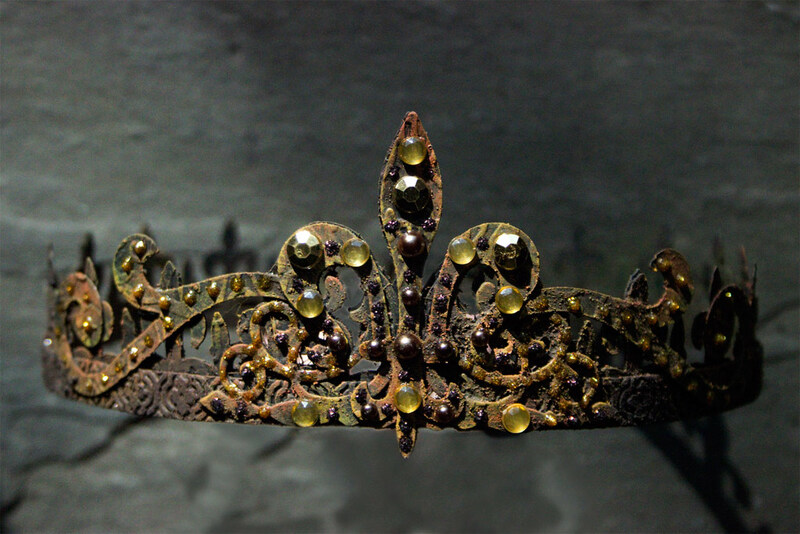 This will provide support to the Crown as you Embellish. Grab your favorite assortment of flat backed pearls and gems and Let the Embellishment Begin! 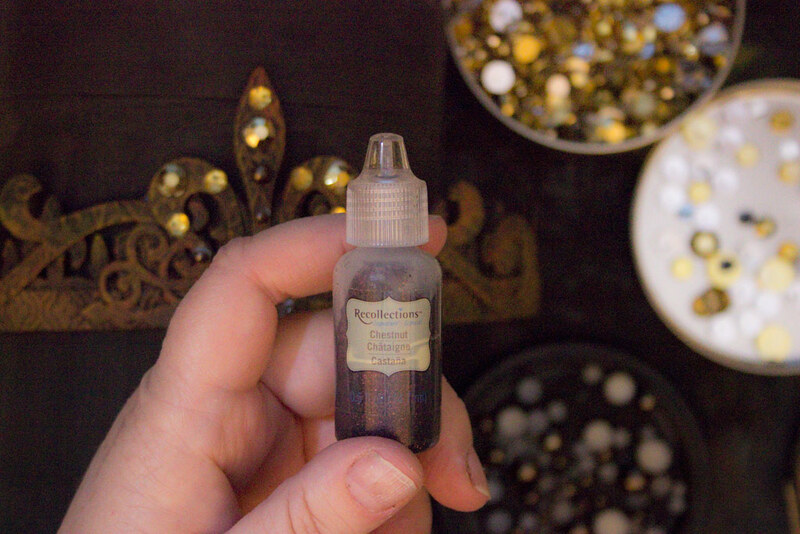 I recommend Gem-Tac for this process, even if your gems are ‘adhesive’. Nobody wants to lose the Royal Jewels! 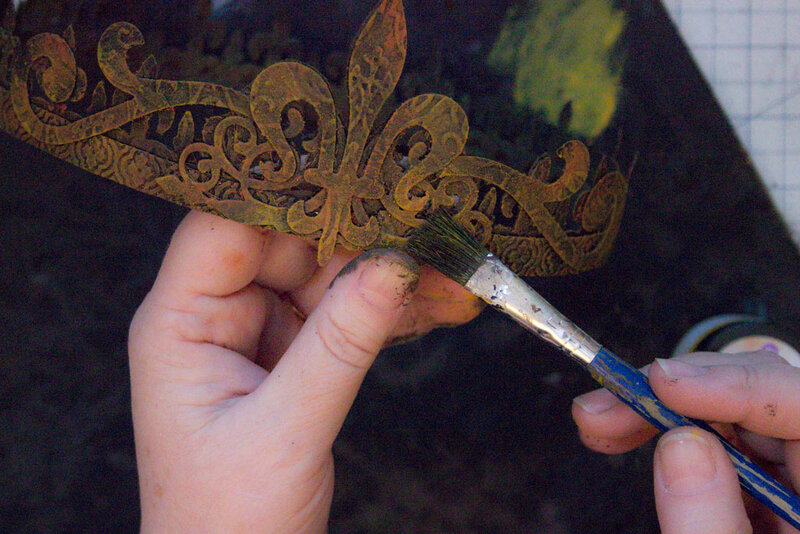 Add dots of Bronze Glitter Glue, to accentuate the Rusty Glamour of this Crown. 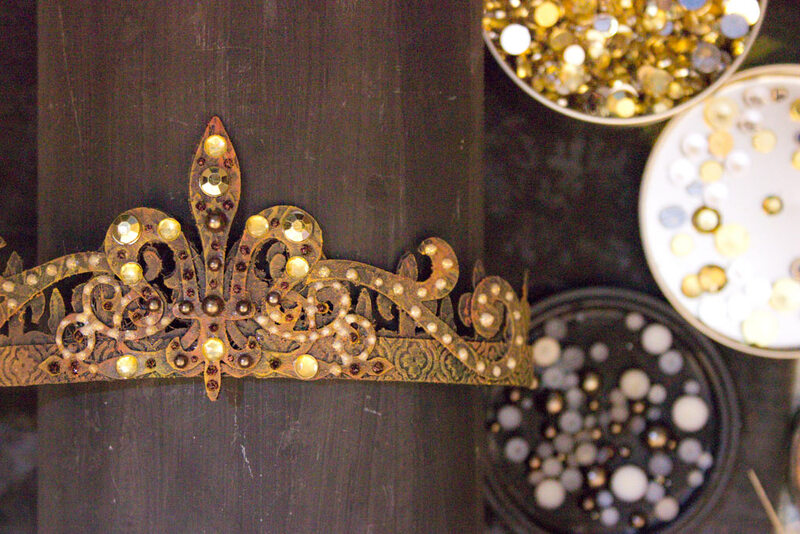 A few dots of brighter gold sparkle, and we have an elaborate Crown, fit for Royalty…like YOU! Here is a smaller, less elaborate version. This one is sized perfectly to perch in the branches of a Christmas Tree, or sit fetchingly on the head of that Grecian Bust that you have tucked away in a corner! 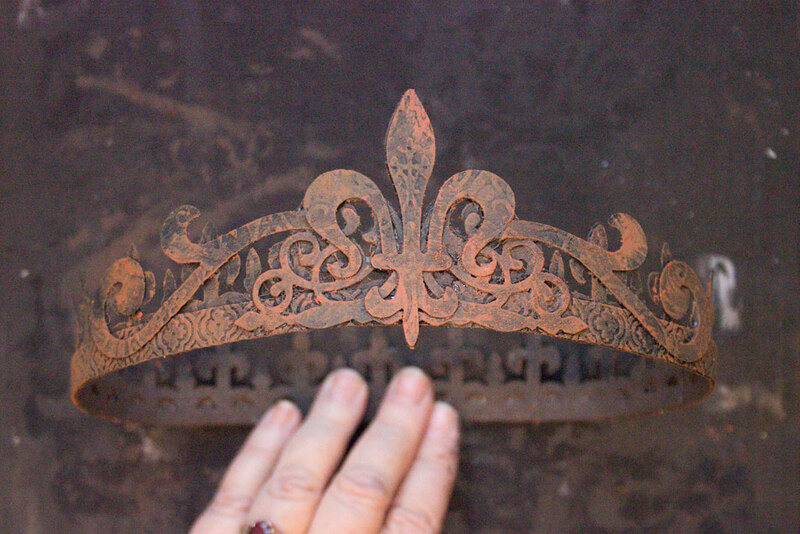 The combination of Rusty Goodness and soft touches of Bling melts my heart! 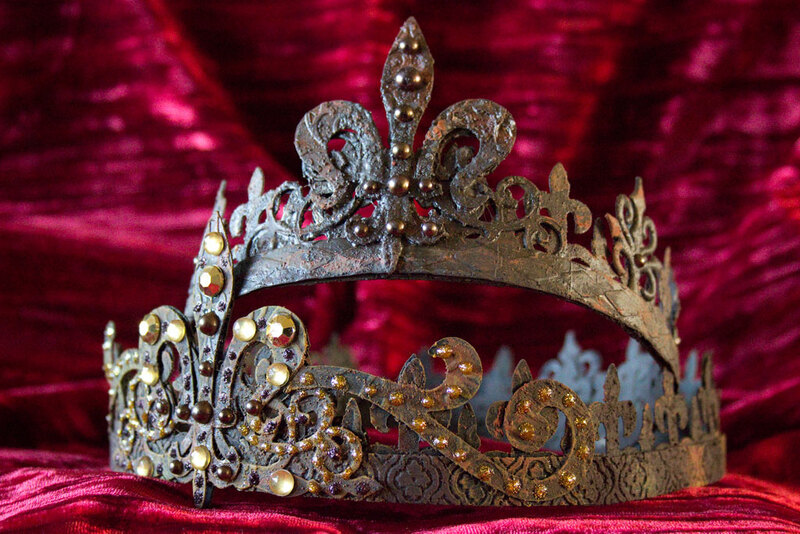 This one is sized to fit on your own lovely head, whilst you issue Royal Decrees! 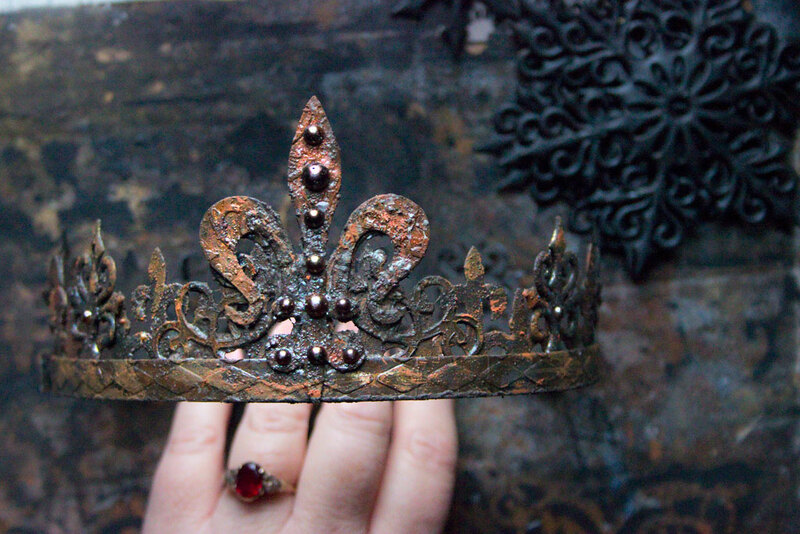 Both DIY Faux Metal Crowns have Serious Presence! And there we have it: from Humble Cereal Box to Royal Treasure! Thank you SO much for visiting The Graphics Fairy today! I hope that you have enjoyed this Royally Frivolous Experiment, and that the techniques will spark ideas for your very own Precious Projects! 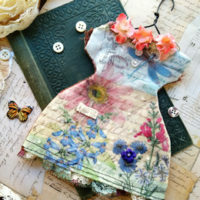 Come see me at Thicketworks, if ever you crave a bit of Quirky Crafting Madness! « Antique Botanical Juniper Branch Printable! Well, Heather, this project is beyond impressive. 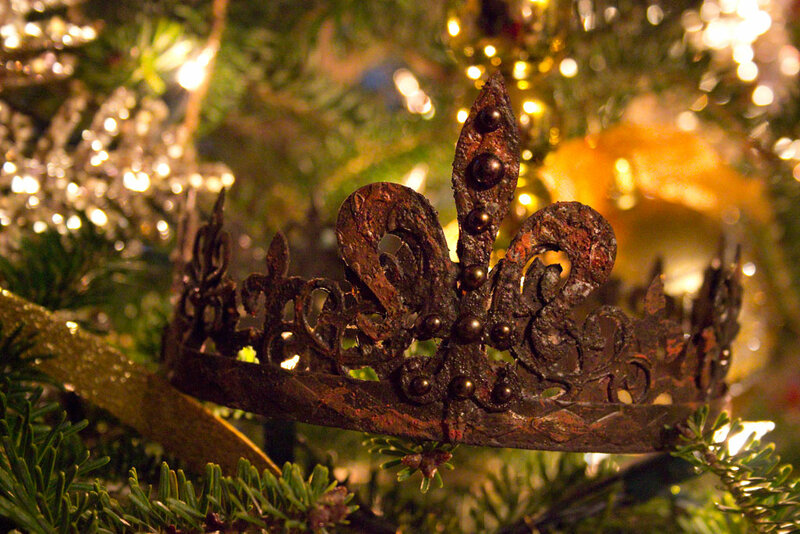 Your crown may have humble origins, but it is regal in design and finish. Thank you, Karen, for sharing Heather’s incredible creation. Yay! So glad you like it, Ardith. It was such a joy to create, and I think I may just have to make MORE! Thank you for your kind words, my friend. I love this! I made crowns for the children in my Sunday School class, and every time they achieve a goal, they get to glue a plastic cross or bling embellishment. Every time they get 10 “ornaments” on it, they get to wear it to church service to show their achievement. They actually like the grunge beginning and transforming it into a beautiful “antique.” The adults enjoy their enthusiasm for this project. 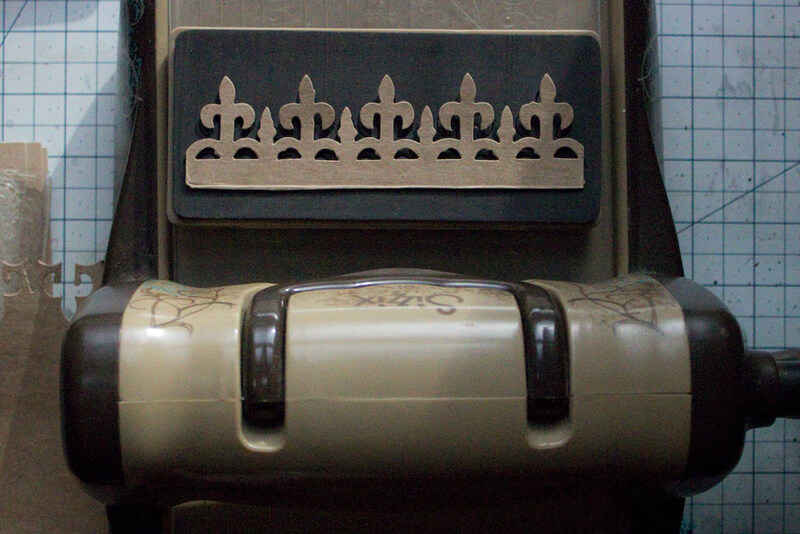 Another plus: the crown motif fits well into many lessons. Hello, Ann! 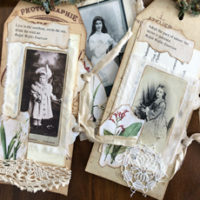 What a wonderful way to engage the children and provide them with a keepsake they will cherish! Crowns are so FUN! We always do a little craft session after a quick lesson. They love it, and hopefully will continue crafting throughout their lives. Heather! This project is beyond incredible! 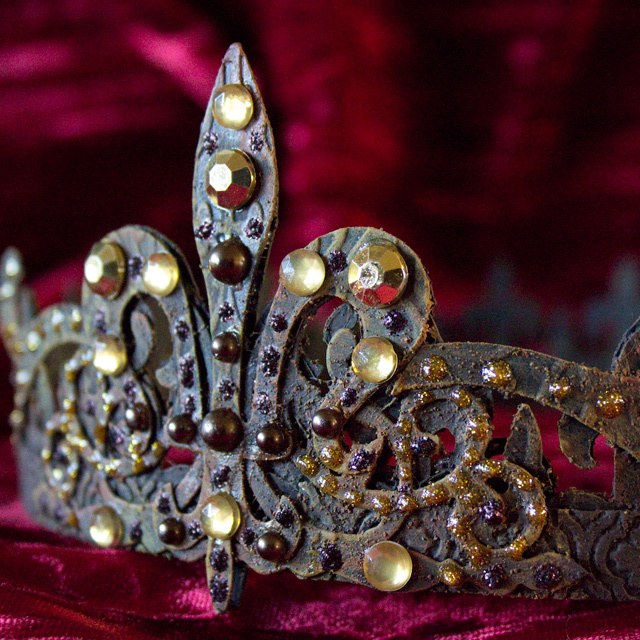 With these marvelously exquisite crowns, I was sure the tutorial was gonna be a headache. Ha! That’s never the case with you. Thank you for clear, concise instructions. I gotta try this! Hi Gunnvor! It makes me so happy to connect with other creatives who see the possibilities in ‘rubbish’! We are surrounded by so much raw material, and these days we have access to such wonderful tools to re-imagine it with. Thank you for being so kind, and for visiting The Graphics Fairy! THANK YOU SO MUCH FOR THE GREAT TUTORIAL, AND THE LINKS TO THE PRODUCTS NEEDED. Hi Jan! So happy that you like this little project…and it is my pleasure to share tips n techniques, my friend! Thank you, thank you, thank you! This is soooo cool and the fact that it is made from recyclables is the best. I appreciate your willingness to share your talents. 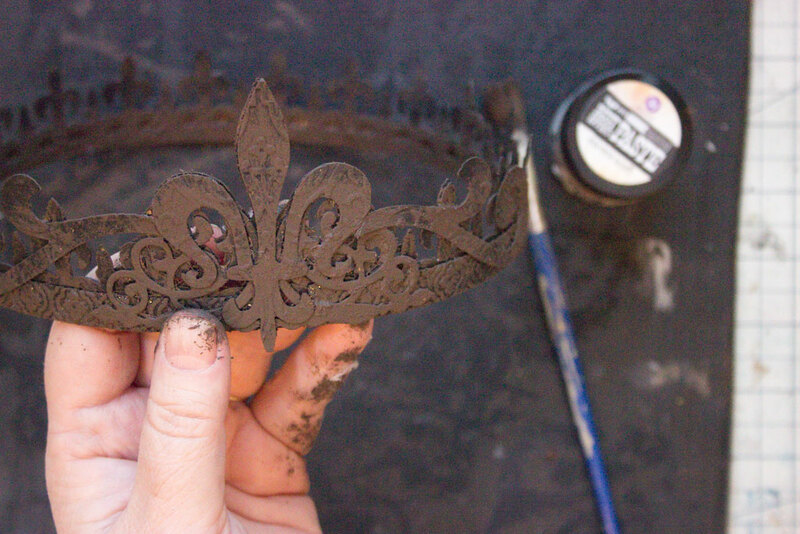 I love these crowns to bits – and crave a rusty little tiara all of my own. But, alas, the only items on the materials ist I own are scissors and baby wipes. To purchase everything else (including the cereal) would cost me as much as moving to England, wooing and marrying a duke, inheriting the family tiara, burying it out in a field for a few years and waiting for it to tarnish. I hear you Zeli – I certainly wouldn’t have invested in the necessary items for this project alone. However, the Big Shot and dies are part of a group of tools that I turn to again and again, for many different projects. Thank you for visiting today! Thank you so much for posting this with links to products! So helpful. “measure your head” That had me laughing…what a great transformation! My dear husband can’t understand why I keep all that thick cardboard from boxes etc. I know it will be put to good use (one day) but given my slow crafting process, he thinks I am just hoarding 🙂 The finish, the whole process is just amazing as usual. Only you can come up with such brilliant ideas and explain it all so well! Wish you a very happy, peaceful and joyous new year, filled with lots of creativity! Is there anywhere that sells the cut outs as I don’t have the money to buy those cutting machines! I tried to hand cut the shapes with an exact knife…not great results. Thanks so much! I’m sure there are others – good luck! Disappointed that this takes a lot of expensive materials, guess it’s out for this household :(. Thank you Karen for all of your French labels, I love them. I made a flower pot and put a label on and it looks great.